This is one of those pioneering SF novels, more of interest to the aficionado than to the general reader. It is episodic in nature, and was serialised in one of the old magazines which Isaac Asimov cut his milk teeth on. In fact, I initially read the first episode of this novel in Asimov's Before the Golden Age: A Science Fiction Anthology of the 1930s, and was delighted to see the full novel at a charity sale.The premise is interesting, though the science is a bit wonky. The banker Winters manages to put himself in suspended animation in a lead-lined coffin beneath the earth, and programmes himself to wake up after 3000+ years (in the year 5000 A.D.)using the effect of "cosmic rays" from radioactive material (don't raise your eyebrows - I told you that the science was eccentric). In subsequent chapters, he wakes up in uniform intervals of 5000 years, up to 25000 A.D.The character of Winters is a sort of Gulliver of the future who travels through time, and is just a plot device for the author to speculate on weird human societies (we have a tribal society, people controlled by a computer, modern-day Lotus-Eaters who sleep their life away, an anarchic society of individuals and finally, immortality). Even though the imagination is fantastic, the stories are simplistic to the extreme and the writing leaves much to be desired - a reader of today will find most of the stories outright silly.However, three stars for a pioneering effort and genuine flights of imagination. This is my all time favourite science fiction work. I discovered this as a teenager. Lawrence Manning only ever wrote this, originally serialised on magazines, and then "retired". A simple premise which results in an epic journey. So many modern sci-fi concepts are born here. This is the ONE book I have kept from my teenage years. Putting aside the science of suspended animation,wrong,this is a interesting and valuable tale. A man after a long suspended animation in order to see how the human society evolves in the long time (a doubtful option seeing the today world ) awakes in a world that is a near utopic society,living in small comunities with direct democracy,a sustainable explotation of resources and with advanced tecnology that leaves the people a lot of spare time for leisure,hobbies ,study or investigation (it remembers me the short novel by Marion Zimmer Bradley : The Climbing Wave ),yet this society is not wholly utopic ,threre are conflicts in the intergenerational solidarity in the use of resources.It is also a striking and visionary tale for 1933, because this new society blames the ancient world society for to squander the natural resources and burning without control the fossil fuels ,disregarding future human generations.In the end the man resumes his suspended animation wishing to see the next stage of human society evolution.A already mature,modern,rather visionary SF tale.This tale was published in March of1933 in "Wonder Stories"
Recommended on I Heart Chaos, I found it on PaperBackSwap and decided to pick it up.This is possibly the most interesting sci-fi novel from the 30's that you will ever read. Manning's writing shows its age in places, but his visions are truly advanced and interesting. Although he wrote in a time long before the term Posthumanism had been defined, his writing shows a real understanding of the concept. Truly an excellent sci-fi book that I'd recommend to anyone who has an eye toward reading older sci-fi of value. I first read this when I was in my 1st year at uni (1996) sitting in a park with a bag-of-beer. it was a beautiful experience. this is one of the few books that I have read more than three times, I know I will always return to this this book, time and time again. One of the great underrated 'classics' of early science-fiction. 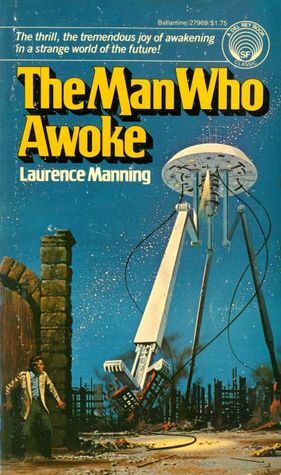 I first discovered the work of Laurence Manning in a big anthology edited by Isaac Asimov that was called Before the Golden Age. This anthology was devoted to stories that the young Asimov recalled being particularly impressed by when he was reading pulp SF magazines in the 1930s. His anthology includes Manning's story 'The Man who Awoke' and I found this to be one of the most interesting tales in the collection.I knew from Asimov's preliminary note that this story was only the first in a series. So I sought out the others. There are five in total. The conceit is that an elderly scientist by the name of Norman Winters puts himself into a drug-induced sleep in a lead-lined chamber deep underground with a mechanism designed to awaken him periodically throughout the future.He first awakens in 5000 AD and thereafter after five millennium gaps. His first awakening is the story that appeared in Asimov's anthology, here re-titled 'The Forest People'. It's an utterly remarkable work that has as its basis ecology and the waste of natural resources. In this respect, Manning was years ahead of his time as a writer.In fact, the four stories that follow are equally superb. Manning was surely one of the best (perhaps the best) science-fiction writer of the 1930s. The five linked adventures that form this book deal with such themes as: artificial intelligence, virtual reality, eugenics, atomic energy, the transmutation of matter, politics, ethics, philosophy. My favourite of the five tales is probably 'The Individualists' which moves at a breakneck pace.These stories were published in 1933 and one wonders if Manning had read Olaf Stapledon's Last and First Men because that earlier masterwork (published in 1930) is the only book comparable to the grand fictional scheme worked out here. The Man who Awoke is an incredible book that deserves to be better known. Wow, I'm geniunely impressed that so many people know and love this book. Although, I must admit to being ashamed of my reasons for reading this. Lawrence Manning was my great-grandfather. I enjoyed this story, yet did not love it. It's sad that I find complete strangers with a greater connection to it than me, but nonetheless I'm proud his work is still remembered. I hope people will continue reading and remembering much longer. Really 3.5 stars. It was definitely an enjoyable read and a fun romp through time. It felt to me more fantasy-like in a sense though (its not really a fantasy though) as no technology was explained nor did any of it really seem like it could ever happen. Manning's storytelling within these made-up "worlds" was cool enough though. Its a quick fun read that I would recommend to people with an extra day or so on hand to take in. I really enjoyed this book and would read it again if I had it in my collection. The five stories in this fix-up novel were first published in successive issues of Wonder Stories during 1933. Laurence Manning was a Canadian-born science fiction writer (1899-1972), who authored several series of stories for pulp magazines, and mostly gave up his writing career in 1935 to run a mail-order nursery business. In 1975, Ballantine published them together in paperback form for the first time.The stories concern a man named Norman Winters, who puts himself into a state of suspended animation and wakes up successively in 5000AD, 10000AD, 15000AD, 20000AD, and 25000AD. Each awakening constituted one of the original stories, and portrays successive and varying visions of the future of humanity. At first, it was difficult to believe this was written almost 80 years ago, as Norman wakes up in a world whose oil and fossil fuel resources were depleted by a selfishly consumptive period of history called the 20th century. But then, in later stories, Manning's less prognostic forecasts of the power of the atom, and of biology are amusingly naive. And certain concepts (giant tripods, human evolution in the future) seem to have been inspired by H.G.Wells writings, which were only 40 years earlier. In the end, I found it interesting, mostly from a historical point of view. This is a series of linked stories based on a variation on the theme of Wells' THE SLEEPER AWAKES - a man of 'our time' goes into suspended animation and wakes up in the future. The difference is that Manning's protagonist is an old-ish tycoon who deliberately puts himself into suspension (in 1930s USA) with a timer system so that he can awake in the future and do a bit time tourism. The first future era he encounters is remarkably prescient - a low-population, eco-friendly world where the biggest political issue is forestry. If that sounds a bit tame, well it is, but it's also interesting to see how Manning anticipates the Green movement. Other historical eras encountered include that sci-fi classic, the enclosed city dominated by a giant mechanical brain; a violent libertarian world of utterly selfish individuals; a world of 'virtual reality' where the vast majority of people spend their lives dreaming; and a far-future civilization of highly evolved humans who've discovered the secret of immortality. While Manning was nobody's Voltaire, he was imaginative and this book has considerable charm. I read this when I was ten, my dad had it on his shelves. It was one of the most amaizing books I had ever read, and far beyond what I had ever imagined at that age, and I was a writer, an imaginer extraordinaire! Its scenes stayed with me ever since, the concrete highway overgrown, the people retreated into a dreamworld out of the real world, and in these it prefaced many later books and stories to come. Some of it no doubt owes a debt to HG Wells' 'The Time Machine' but it is a continuum - just as later books draw on elements of this one, so this one draws on earlier ones.And it was remarkably well-written, engaging and drawing one in. This was another of those epic books from my final year of primary school where so much of what I read shaped my creative self for the rest of my life. A brilliant book, very evocative and one that stays in the memory for a lifetime. Prophetic sci-fi book from the 1930s that accurately predicted genetic engineering and the internet.